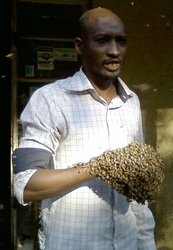 Bee-keeping in the Zaria area. Beekeeping Is the art of rearing honey bees for their by-products either for income generation, Medicinal benefits (apitherapy) and for pollination of agricultural crops. (1) Apiculture - management of the honey bees for their by-products. (2) Apitherapy - Application of one or more of the by-products for medicinal uses for humans and animals. (3) Crop pollination - honey bees are the most important agents in most crop pollination. Their activities help increase crop field by up to 40%. The society is non-profit local NGO operating in Kaduna State, Nigeria. (1) Improve on the income level of the rural farmers (including Women) through Beekeeping. (2) Establish farmers extension groups as sustainable approch. (3) To identify and liaise with National and International Organisations (including individual women or women groups) involved with or related to beekeeping developments. (4) To seek Assistance (Grants/Funds) for beekeeping development projects. Membership: Currently the society has 8 active members. - The Canadian International Development Agency (CIDA). - The Development Cooperation of Ireland. 5. Recived twelve International Agricultural Consultants from the United States Department For Agriculture and the Tuskegee University through Winrock International.